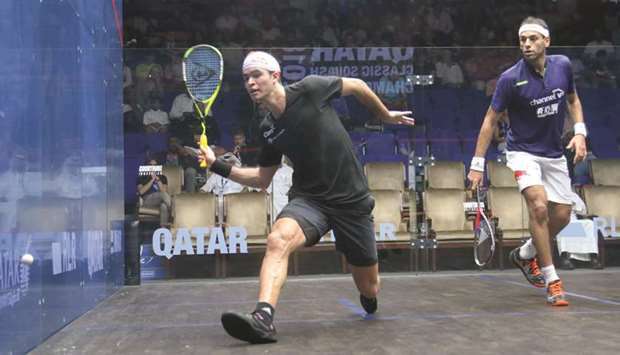 The “Peruvian Puma” Diego Elias reached his first Platinum level semi-final at the Qatar Classic and what better way to do it than to take out the defending champion and world number one Mohamed ElShorbagy. What is more impressive is, Diego did it on the court ElShorbagy had recently described as his “home” court. He did not allow the dangerous Egyptian to get into his zone of a fast and furious pace. Every shot from the racket of Elias was calculated, Rarely would a drive be over hit and every shot was hit with a purpose. Whenever the pace was upped, Elias would lift it high and wide enough just to break the momentum. Even when he was denied a court wipe in the final game when he was 10-4 up after an energy zapping rally, he nonetheless kept his cool. Despite losing the next three rallies, he maintained his composure and when an opportunity arose, he duly placed a backhand volley to the front beyond ElShorbagy’s reach and dropped his racket in celebration. “I’m really, really happy with my win today. Somehow, I always play well against the good players. ‘’I started the day well today and I knew I was going to have a good day. The win was also extra sweet for the Peruvian, who has twice come within striking distance against ElShorbagy. “We’ve played some really tough matches. I lost 3-2 twice so I just had to believe I could win these matches.